Calubin_175 wrote: It appears that modern MS are at least equal to the MS performance of the Calamity War era including the 72 Gundams, but maybe only the Gundams had the Alaya-Vijnana and therefore syncs with the pilot more intuitively. im not so sure if the Alaya-Vijnana is limited to the Gundams. When McGillis talks to Gaelio in this ep, he mentioned that the Alaya-Vijnana is developed to maximize the abilities of MS. If the Alaya-Vijnana is limited to the Gundam, i would expect him to say Gundam in the sentence rather than MS. Besides, when mentioning Gundam, the two Ahab reactors are always the talking point. I think the HG Barbatos' manual also said that "ancient mobile suits require organic device systems". I always assumed that only Gundams were ancient mobile suits that we could expect to see in this series but if they are other non-Gundam old mobile suits which is seemingly now the case, then that changes things. -Mobile Worker(CGS/Space Use) Model number:TK-53/s, overall height:3.5m, dry weight: 2.3t. Space specification customized Mobile Worker by Tekkadan. By equipping a Propellant Tank and Vernier Nozzles, outer space activity became possible. -Revolving chamber-style Grenade Launcher: revolver type grenade launcher that fires explosive shells. It has been adopted as a Hyakuri equipment in Teiwaz. Backpack mount is possible. -4-tube Rocket Launcher: 4-tube relatively light weight rocket launcher. The use of different warheads(explosive shell, smoke shell, napalm shell, etc) for different purposes is possible depending on the objective. -Surface Use Booster Unit: additional booster that has been developed in order to improve the Graze's mobility under gravity. The fuselage's posture control becomes easy by deploying the grips, acrobatic flight is also possible. -Bazooka Gun: rocket shell firing gun that has been developed as a Graze standard armament. When the Graze uses it, mount on the shoulder rack is possible and it's able to fire even without being held by the grip. When traveling and so forth it takes a carrying behind the shoulder structure. By a battle with Gjallarhorn at the low orbit station, Tekkadan takes possession of one and employs it in the following battles. -Hyakuri has long distance solo flight and high detection capabilities to operate in the asteroid belt. -Hyakuren is a post war developed machine that took a long time to complete but has not entered full MP yet, only 44 machines produced so far. Uses Ahab Reactor from the Calamity War. Last edited by balofo on Tue Nov 10, 2015 3:15 pm, edited 1 time in total. I guess that further solidifies the Gjallahorn Ahab Reactor monopoly thing. Going off of that then, is that implying that the Hyakuren is a post-war machine built using leftover or scavenged Calamity War tech, or is it a newer mobile suit that uses tech based on Calamity War tech? Considering that it specifically mentions that it's 'not yet mass produced', it makes me think that they are constructing these suits as they find the parts to do so, which implies they are using scavenged tech. Do the manuals say anything about who made the mobile suits? Interesting. So they build new mobile suits but have to use older Ahab Reactors outside of Gjallahorn. I wonder if we get a similar situation to the 00 Manga which has the fifth GN Drive being passed around for four or so different Gundams. So no inner frame in the HG models of these guys then due to no parts swapping play value. Let's guess production numbers. If Teiwaz only has 44 Hyakurens operational(some more WIP) across all spheres and not considered to be in full production, then the Graze must be somewhere 10 times that figure (500) across all spheres perhaps. I am guessing they would have 100 or less within the Mars Sphere. With the Ares Garrison, losing 4(and 2 green ones) Grazes out of 6 was a big deal, but they aren't completely finished yet. As much as I like the Hyakuri's innovative design, I find it a bit odd in terms of practicability as it doesn't fold its lower torso in flight mode to reduce its target surface area. In space there is no need for aerodynamics, but at least reduce its surface area. That was what made MAs like the Bigro which emphasised on straight line speed and hit and run tactics so formidable as they were difficult to hit. -Graze Custom: The Graze is Gjallarhorn's current mainline MP MS deployed in the Earth Sphere and Outer Sphere. Now, the MS development's keystone, the Ahab Reactor production, has become a monopolized technology by Gjallarhorn; the Graze has been developed in recent years as a state-of-the-art machine. When the Mars branch corps attacked the CGS HQ facility, the machine 1st Lieutenant Orlis Stenja was piloting is seized. Furthermore, 1st Lieutenant Crank Zent's Graze also fell into Tekkadan's hands since he was defeated in a one-to-one fight with Mikazuki Augus. Because of the violent partial damage to the fuselages, operating the 2 seized machines as they were was impossible, however by Nadi Yukinojo Kassapa and Yamagi Gilmerton efforts the available parts were aggregated into one machine so it was restored as the Graze Custom. At first the machine was to be sold, it was planned to be assigned to Tekkadan's operating funds, but they suffered a Gjallarhorn attack at the low orbit station and for the sake of fighting back, Akihiro Altland boarded it. Thereafter, it is being used as Tekkadan's military power. -Akihiro Altland: when he was a child his parents' trade ship was attacked by pirates and he was trafficked for money as a Human Debris. He showed confusion when piloting the Graze Custom since it hasn't the Alaya Vijnana he was accustomed with of the MW. If he has time he trains. -Graze Custom: when repair is done to the Graze Custom the damage to the head and shoulder parts was great so a Tekkadan original retrofit was done. A booster was added to the back. The machine's top part armor strength has fell, however the gross weight became lighter so a mobility and turning improvement in outer space can be expected. -Environmental activity: It is a MS that Gjallarhorn developed, by nature the Graze is a machine that can cope with every environment. Plenty of retrofit parts exist, in regard to equipment change its adaptability is extremely high. Also taking into consideration the ease of maintenance, it has proved to be a help for the Tekkadan mechanics who are unfamiliar with MS.
Calubin_175 wrote: So no inner frame in the HG models of these guys then due to no parts swapping play value. Actually, I'm not so sure about that. Looking at the runner reviews on Kenbill, they look like they might have inner frames. No part swapping value like the Barbatos and Graze, but frames nonetheless. Same here. I love the design a lot, but I find this to be pretty silly. A rough translation of what i could understand from the links posted by balofo on Hyakuri and Hyakuren. A high mobility MS used primarily for patrolling, it is used by Teiwaz and its subsidiaries. Teiwaz operates in the outer sphere where the Ahab Waves are unstable, thus MS with high search capability and long distance solo flight ability are needed to operate in the asteroid belt and debris region. The protruding backpack contains a large sensor for detecting Ahab Wave. The backpack serves as a large booster unit and a weapons rack. During combat, the suit excels in hit and run attacks due to its high thrust. The machine’s mobility is a threat to enemy ships as it allows it to evade anti-air fire. The suit’s mobility caused trouble for the Tekkadan, and it battled with Barbatos. During recon mission, the suit is deployed on its own. Turbines usually deploys a team consisting of one Hyakuri with two Hyakuren. The hyakuri serves as a rear support unit. Due to the suit’s unique backpack structure, the suit’s weight balance is terrible. It is mainly used in space. Besides the standard loadout, the Hyakuri also has an intelligence support form specializing in recon and search, and another form for fire support, whereby the backpack is loaded with heavy equipment. The intelligence support form is mostly used during planetary travels, while the fire support form is meant for base defence. The suit can also fill its backpack with weapons/ammunitions for supplying the frontline. Euro Electronics is a subsidiary of Teiwaz that operates in the field of heavy industries. 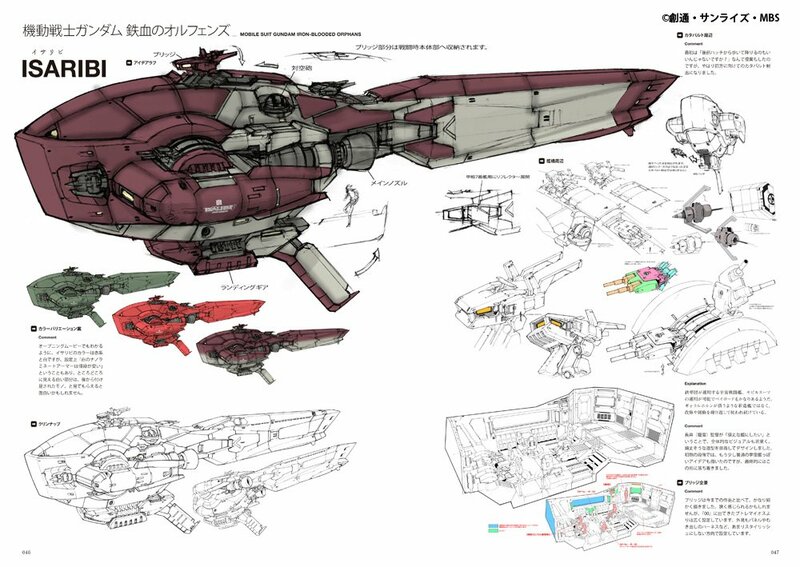 Hyakuren is based on the design plan of a high output machine designed during the late stage of the Calamity wars. Teiwaz got hold of the plan and took a long time to complete the frame. As the suit used Ahab reactors from the ancient times, it cannot be said to be a machine made completely by Teiwaz. It is an important machine as it is a frame completed in recent years outside of Gjallarhorn. The fact that the machine has not entered mass production showed how difficult development of the frame was. The 44 machines made so far primarily operates in the Asteroid belt and debris region, and are equipped with heavy armor. The suit has strong performance in close combat, and its weapons are designed for a balance between ranged and close combat. It is a general purpose machine unhindered by the environment. The suit is a symbol of Teiwaz in the outer sphere. The suit was designed for all-round usage. It is an excellent machine that display its performance in the tough space environment like the debris region. The blade and its sheath can also be mounted on Hyakuri’s backpack. The rifle cannon is a light rifle, and has a sliding stock structure at the rear. I'm curious, does the old Ahab Reactor and production limitations (including the 44 total) only apply to the Hyakurens or does it also apply to the Hyakuri? I do find it odd that the HG Hyakuri doesn't mention it when Hyakuren one makes a big deal of it. Also, I'm curious, was Ahab "Particle" ever specifically mentioned? I think I remember seeing it in the HG Barbatos translation but just about everything else aside from that just uses Ahab "Waves" so I'm beginning to wonder whether they word will ever show up again. And even then, waves and particles aren't exactly the same thing so I don't think it's a coincidence that those two words were chosen in the writing. I'm just curious on whether they are the same thing at this point (it being able to be either) or whether they'll go on the route of them each having specific traits. Okay, so I'll retract my previous statements about the Hyakuri and Hyakuren HGs. They have have mostly complete inner frame, but not as substantial as the Graze or Barbatos. Still more of a frame than the average HG, but not a full one. Certainly no full inner frame, but it facilitated for top notch elbow and knee bends. Either way, I will skip this line and wait for better figures. Hyakuren tend to operate in pairs but for reconnaissance, they are companied by an additional Hyakuri. Calubin_175 wrote: Hyakuren tend to operate in pairs but for reconnaissance, they are companied by an additional Hyakuri. If i'm not mistaken that is from the Hyakuren's manual right? i think it says that Hyakuren tend to operate in pairs during combat, but the Hyakuri, which excel in recon and patrolling, is often added to form a team of three units. Now we just need the Gjallarhorn Cruiser we see Coral using to chase the Isaribi. For it looks far better then the darn Biscoe Class. Did we ever got the official name of the Gjallahorn Mobile Worker? Or really they really did just use Gjallahorn Mobile Worker? Or the CGS One for that matter. For we have a model number but I wonder if they are actually called CGS Mobile Worker? So is there a monthly schedule for NEW kit/mecha information from Bandai? It always seems like it's the 3rd week of the month, but any confirmation on this? Like, will we be given color silhouettes next week or the week after? Deathzealot wrote: Or the CGS One for that matter. For we have a model number but I wonder if they are actually called CGS Mobile Worker? I believe it is. It's actually called that on the profile.